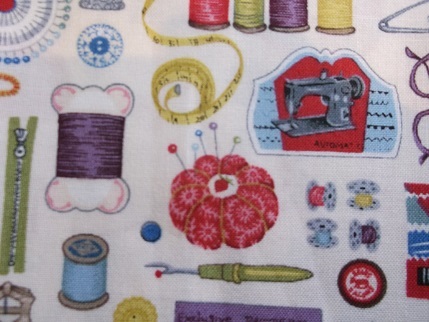 You know when you promise yourself you are not going to buy any more fabric as you already have lots that you haven’t used (and haven’t touched for years) and you really, really mean to stick to that promise but then along comes a really special something so you have to buy it even though it is a bit naughty? 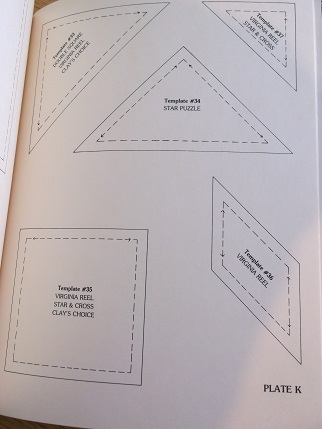 Well that happened to me last week, was just buying some tickets for the Knitting and Stitching Show in November and was checking the list of exhibitors and happened to see one of our local fabric suppliers, Simply Solids, listed so just had to have a little look at their website and they had the most fabulous themed fabric and it was on sale! I think this first one is going to be my favourite – though the others are fab as well. It arrived on Friday but did not have time to really appreciate it until I got back from the weekend. The other exciting thing is that she is opening a shop in town soon with classes and everything! That is probably going to a major dent in my budget but at least the kids will know what to get me for Christmas as I am sure she will do gift vouchers. The justification is that I am planning to make Christmas gifts so it can count as spends for that and not fabric spends, (I did have other stuff to make Christmas gifts with though – just have to use them up quick as well!) We usually go and have a little look in the National Trust second-hand book stalls when we visit properties and came away with a brilliant haul this time. 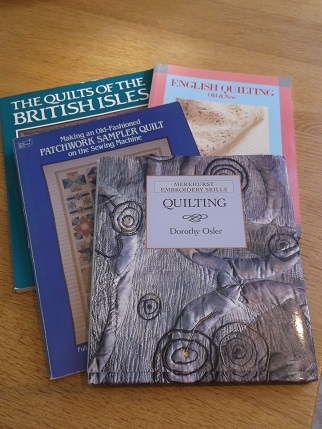 As well as a big pile of fiction books they had just had a lot of quilting books donated so I bought these four. 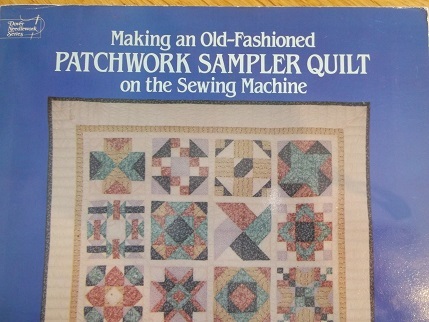 The pink bordered title was published in 1937 and is a detailed study of the history of 19th century quilting and the front book gives lots of hand quilting patterns. 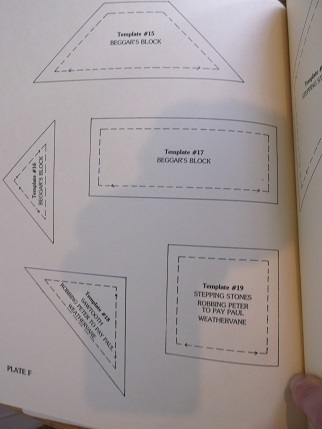 My favourite one is this wonderfully titled publication from 1984 which is so detailed in the process of making a block quilt. 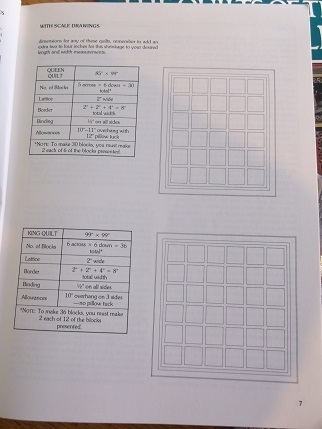 It has all sorts of useful things like a sizing chart for different bed sizes, a block design page where you are encouraged to colour in sample blocks to see which look best and most useful of all are sets of card templates for all of the blocks. 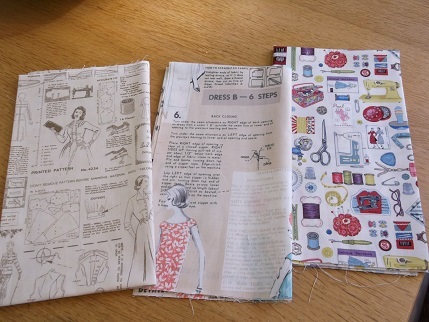 I have decided that I will concentrate on quilting and patchwork for a while (in between lots of kit making sessions). 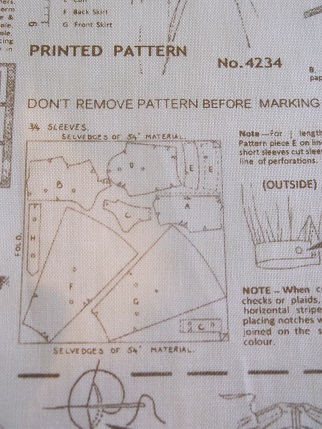 I will still be knitting socially but after 9 bunnies and 3 elephants am going to swap skills for a while and there is so much that I have been wanting to do quilt wise. 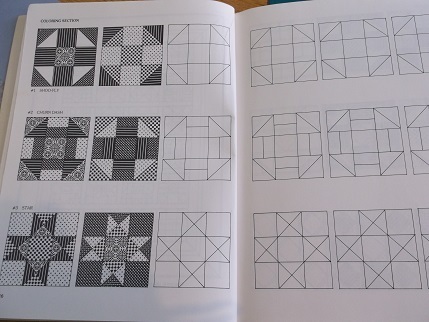 Quilting and patchwork will be the focus of the Christmas presents this year (so that I can feed my hexagon addiction!) and I will be making sewing notion gifts, two more aprons and hopefully a cushion based on this wonderful quilt using found textiles which have been embellished with embroidery and beads. 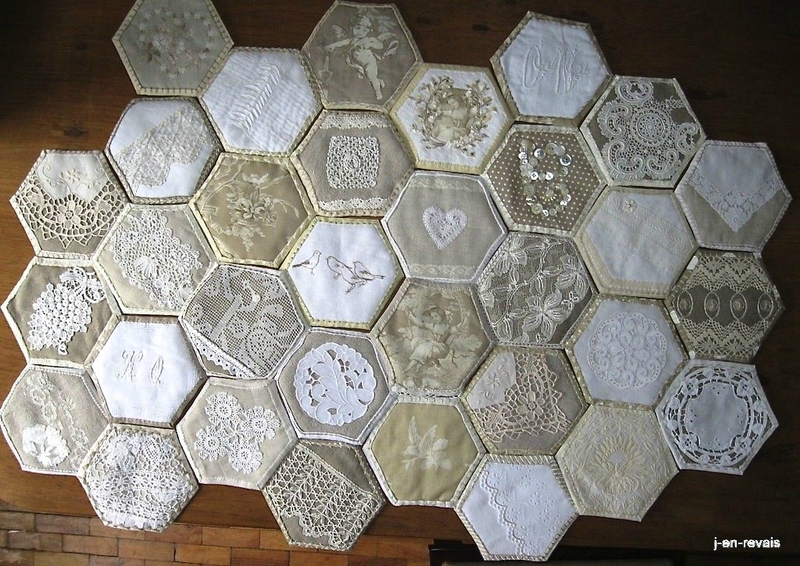 This is from a Bee Quilt Stitch along that I found on this blog – I think it is made by someone called Chantal, the site is in French so not too sure but there are some wonderful hexagon quilts on there done using the quilt as you go technique where each hexagon is made and bound before being stitched together. Isn’t it gorgeous and will be a great was of using up some of the vintage things I have bought over the last two years. So am going to be very busy and happy during the off-season! Take care and thanks for visiting. Very busy indeed, it seems to me – but I am sure it will be fun! I love the idea. 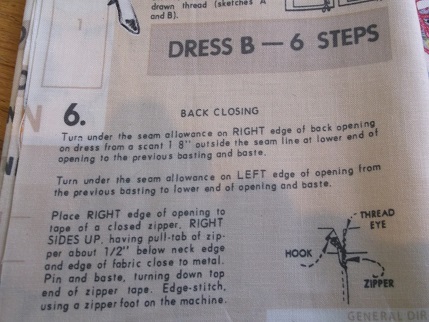 Any chance of a brief tut re fabric and wadding sizes etc.. Yes when I have completed it I will do a brief guide to what I did, am really making it up as I go along but seems to be working!